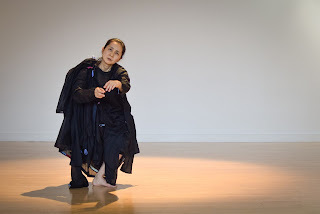 I'm thrilled to be a part of an exciting series of performances created by choreographer Ayako Kato at Links Hall during the next two weeks. She has realized 30 pages of Wandelweiser composer Manfred Werder's 4000-page piece stück 1998. As the composer specifies that a single page of the score can only be performed once, each evening will feature a different excerpt of the score and uniquely explore the intersection between music and dance. Links Hall, 3111 N Western Ave, performances begin at 7pm. 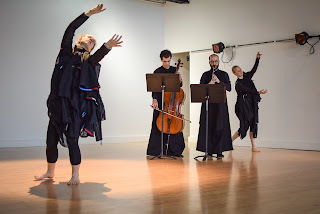 Composition by Mandred Werder; Actualization by Corinne Imberski, Wilson Tanner Smith, Jeff Kimmel, Christina Martin, Ayako Kato; Choreographic Direction by Ayako Kato with movement invention with artists; Costume by Amanda Franck. You can read an interview with Ayako about this project here.